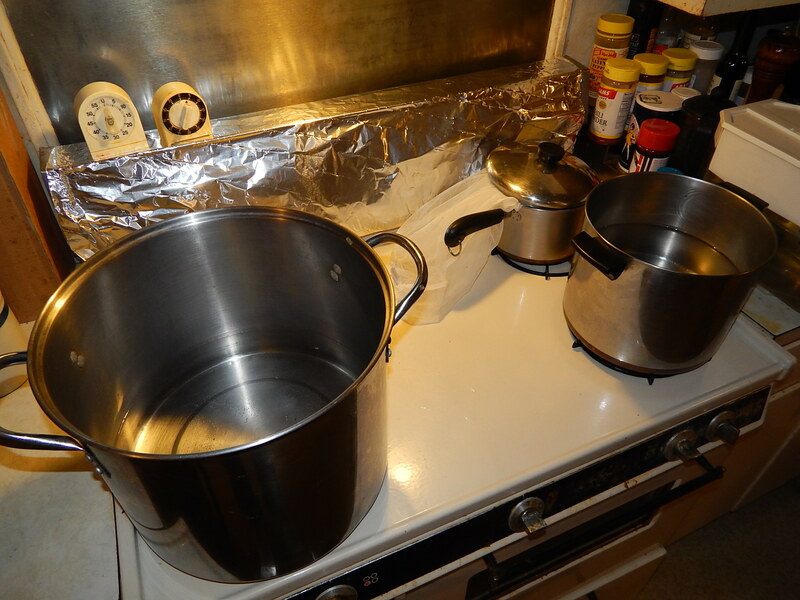 You can make 5 gallons (19 L) of beer by boiling wort on your stovetop, but what about 10 gallons (38 L)? Typical homebrewing practice for stovetop extract brewers is to boil a few gallons (perhaps 8–11 L) of wort and dilute it to 5.0 gallons (19 L) in the fermenter. But if what if you wanted more beer? Could you boil a thicker wort and dilute it to 10 gallons (38 L)? In some cases, this might be possible. To understand when this might be possible, let’s look at the numbers associated with attempting this. Specifically, let’s look at the wort densities, bitterness levels, and wort colors that would result for trying this. If you could dilute a few gallons (11 L) of wort to 10 gallons (38 L) and make good beer, wouldn’t everyone be doing it, at least every once in a while? The time spent making 5 gallons (19 L) of beer could yield 10 gallons (38 L). As we’ll see, there are good reasons why this would yield substandard beer for most beer styles. However, there are perhaps a few types of beer that could be brewed this way — and I’ll give away the punchline by saying that the beer would have to be low gravity, not very bitter, and amber or darker. Here’s why. On the other hand, what if you wanted to brew a low gravity session beer, around OG 1.040, and you planned to boil 3.5 gallons (13 L) of wort? (Either you boiled a larger volume down to 3.5 gallons (13 L), or you boiled 3.5 gallons (13 L) and kept the boil topped up with boiling water.) In that case, the boil gravity would be 1.114 — this is high, but within the range of a strong barleywine and therefore presumably doable. Click on chart to expand. 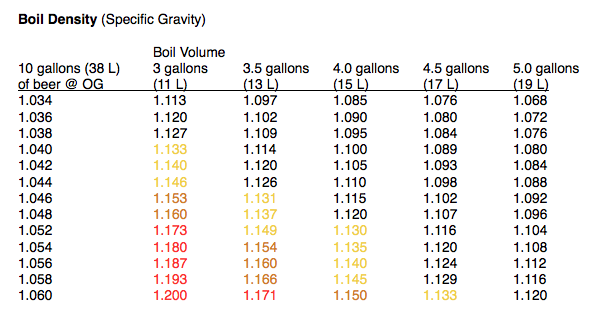 Boil density (the numbers within the table), based on 10 gallons (38 L) of beer at various specific original gravities (OG) and boil volumes. 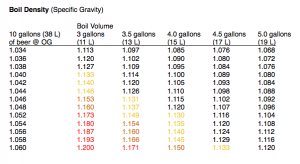 The chart along with this article shows what your boil gravity would need to be to produce 10 gallons (38 L) of beer from various volumes of wort. These are in the range that could possibly be boiled on a stovetop. In the chart, I list wort densities below 1.130 in black, because I’ve brewed all-grain beers up to (and slightly over) that density. (Most of the monster big beers I’ve brewed, such as Krampus Klaws, had sugar as a kettle adjunct.) Above that, I’ve put the numbers in various colors, indicating increasing caution as yellow changes to orange and then red. However, if you’re interested, you can try pushing the limits. If the specific gravity of the boil were the only consideration, and we held the boil gravity under 1.130, quite a few low-gravity BJCP styles could be brewed this way. But beer contains hops as well as malt, so let’s look at bitterness. So, once you figure in bitterness, the number of BJCP styles you could brew this way drops, but you could still brew anything under the above limits associated with their boil volumes. In part 2 of this article, I’ll discuss wort color, brewing tips and beer styles that you could brew with this method.